This is my 2nd board. I made it for a friend. This time I used Mohawk’s Piano Lacquer. It worked FANTASTIC! I highly recommend it to anyone wanting lacquer properties but with a higher build potential than normal lacquer. It sprayed on a little orange pealy but it rubbed out great in the end. Here is a sort of chronological sequence of this build. 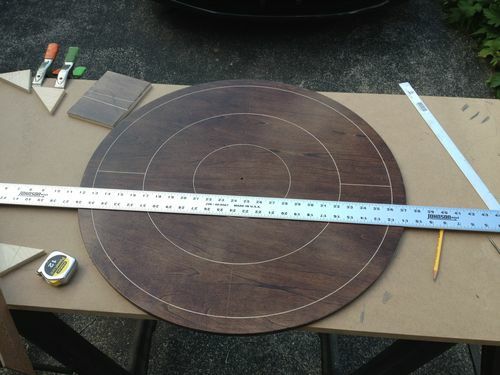 My bosch colt router circle jig setup with v bit for the game board lines. I added short 120 deg lines on the outside for the 3 player cutthroat version of the game. 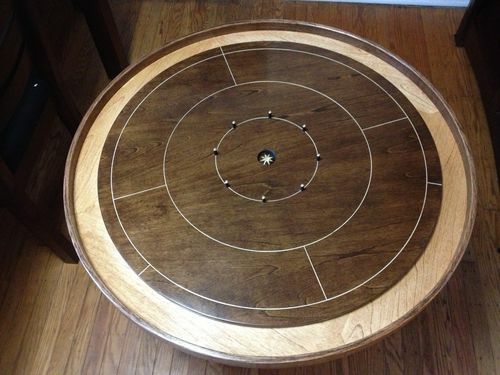 Crokinole ??? Hmmm, never heard of this. Gonna hafta Google it and see what it’s all about. Until about 3 months ago I had never heard of it before either. I have since played many games on my 1st board and I’m hooked. I really enjoy playing the game but I LOVE building the boards. There are so many possible board color / species / decorative / geometric possibilities it is a great outlet for developing creativity. Cool board! How did you inlay the lines? I’ve played that game, first time I saw it I thought it would be kinda boring – dang I was wrong! That Mowhawk stuff is quality, I’ve used it to refinish an old radio cabinet. Great looking board, I’m gonna have to knock one out in the near future. But I’d also like to know how you did the lines as well as the outer ring. The old game of chrochino, a classic for me from decades ago. Nice build and finish on your board. It will certainly get a good deal of use and test the finishes durability. Enjoy with friends. -- If you believe you can or can not do a thing, you are correct. 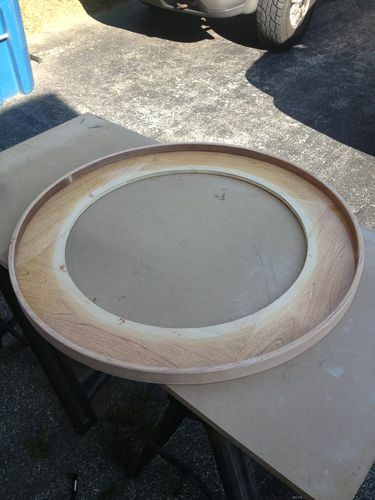 The lines are cut using a V bit in a router attached to a circle cutting jig and then filled with a contrasting color wood putty. You only need about 1/32” of the bit below the base plate of the router to create a nice clean crisp line. 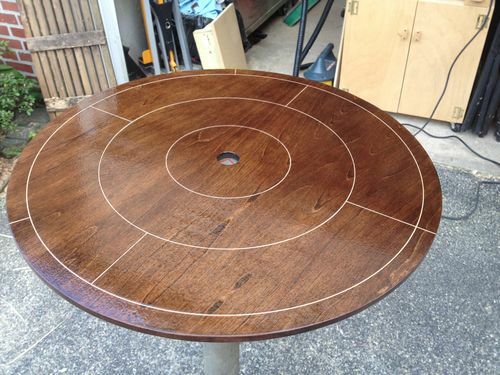 I highly recommend putting a few coats of finish on before your route and fill the lines though. This helps prevent tear-out on either side of the lines. This is especially true if you decide to veneer the board prior to finishing. 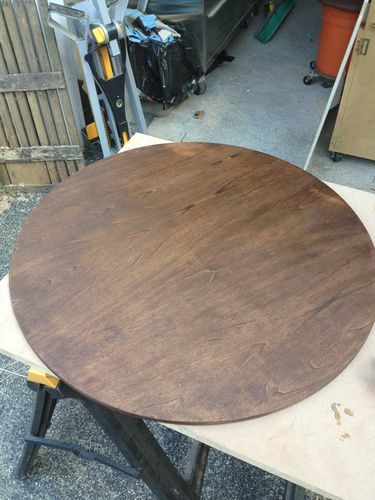 It also makes sanding the excess putty away easier and helps prevent sanding through the stain. As it turns out on this board I really didn’t need the putty because the grooves cut through the stained surface and exposed the contrasting bare birch color underneath. If you don’t fill them, as long as your grooves aren’t too wide, it doesn’t noticeably affect game play. The grooves do get somewhat filled with whatever finish you apply anyway. 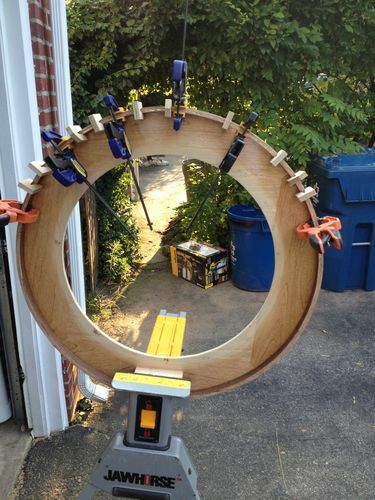 The outer ring, I think you are referring to the rail, is 3 layers of 1/8” thick oak strips. They are 1-1/2” wide. Each layer is actually 2 pieces that each wrap 180 deg around the base. The first board I made I did not prebend the strips and it turned out just fine but even at only 1/8” thick there was still quite a bit of spring load as I bent them around the base. So on this one I did prebend the strips. It made it much easier to bend them around the base and keep it laid down surface to surface without having to use EVERY clamp I own. 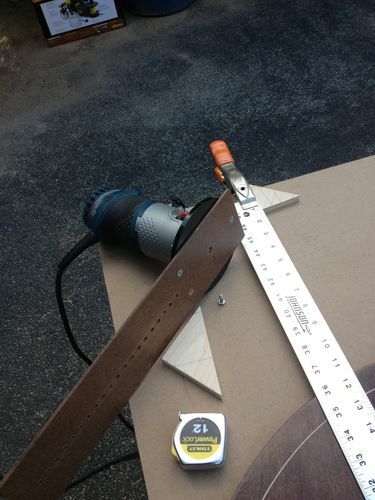 Either way you’ll want to tack the first strip down with tack nails to the base. 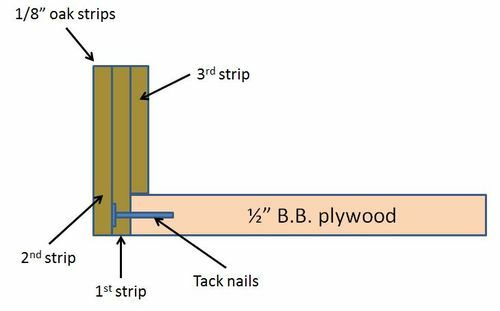 Predrill the holes for the tack nails in the 1st layer or you’ll split the oak strip. See the below cross section. 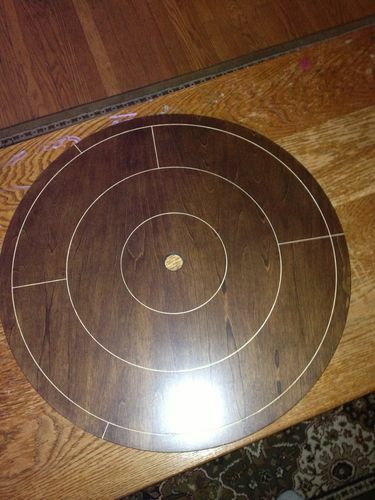 The Hilinski crokinole website has a lot of information on how to build these boards. Much credit to them and the quality of their boards. Great stuff, thanks. I did mean the outer rail, yeah. Two more questions, sorry. 1.) Did you glue three strips of veneer? I’ve only bought veneer much thinner so I didn’t know if it came in 1/8th inch thick strips, or if you cut it to thickness yourself. 2.) I’ve never bent wood before putting it on, how do you do that? Steam? I did glue the strips. regular wood glue seems to work just fine. I am sure you can buy 1/8” thick wood although I’m not sure where and i’m not sure it would be called veneer but it might. In this case I cut it myself first by resawing with my bandsaw then planing to 1/8”. To prebend the wood I used steam. My steambox is a length of 4” PVC. My steam source is a Wagner wallpaper steamer. It works great. I wont go into all the details because there are about 4 million sites and videos on various ways to do it. I exagerate of course but there are a lot. Check out steam bending on youtube. One special note. Steam bending only works with green or air dried wood down to about 12-15% M.C. Most home centers only sell kiln dried which is 8% or less M.C. I found a local saw mill that had the air dried Oak. 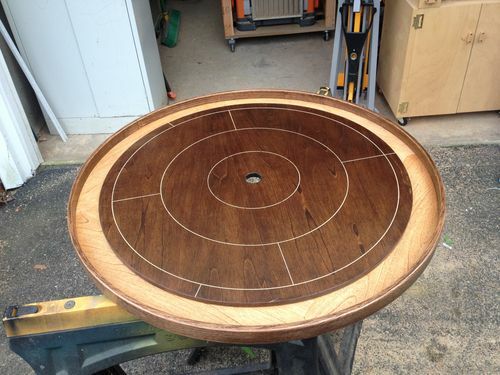 As an easier option if you dont want to laminate the rail is to just build the octagon version of Crokinole. They look every bit as nice. Hope that helps. Thanks all for the comments and compliments.